My experience is somewhat perplexing. My daughter downloaded some videos without me knowing and the family computer caught a virus. I don't remember what it was called but our anti virus program picked it up and removed it. Now Internet Explorer won't work at all. When we load it up it looks like a web page is trying to load. Then, just as we are getting our hopes up, we get an 'Internet Explorer Cannot Display The Webpage' error message. We click the 'Diagnose The Connection Problems' but nothing will fix this. My husband installed Google Chrome, which is OK, but I know how to use Internet Explorer, and want it back. I come across your web page and will give the reinstall option a go when I get a moment. I hope it works for us! Hello Jean. thank you for taking the time to fill in the Reinstall Internet Explorer form. Viruses can cause all sorts of problems. What doesn't really get reported is the after effects once the virus is removed. System files can remain damaged once the virus is cleaned from your machine. This is potentially the case here, although you have checked your Windows Firewall haven't you to make sure this isn't blocking your internet access? Have you also checked to make sure your Proxy settings are not enabled or changed? To check your proxy settings go to Tools > Internet Options > Connections > LAN Settings. 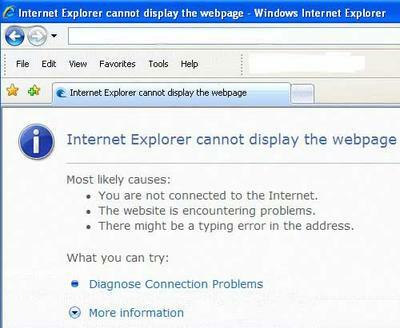 Other things that can case Internet explorer problems include faulty or corrupted Toolbar such as Yahoo, for example. As explained reinstalling Internet Explorer is one of your last resorts. Some home computer users have removed the Service Packs from their machines, and reinstalled them, with some degree of success. Some report this fixes Internet Explorer. Some report this action doesn't fix Internet Explorer. I think removing Service Packs is something you shouldn't need to resort to. There are plenty of other options before you even think about doing this, including using the System Restore Option (Opens New Window). I hope after you follow the instructions on this page your Internet Explorer web browser will be in full working order once again. If you find you are still experiencing issues, take a look at this Microsoft Answers Page (Opens New Window). It has lots of options to fix this issue. Some are quite technical. However give them a go if you are feeling confident. Join in and write your own page! It's easy to do. How? Simply click here to return to Reinstall Internet Explorer.